One characteristic of BBC reporting since the 72-hour ceasefire expired at 08:00 on August 8th has been confusing and cloudy presentation of the actual sequence of events which fails to adequately convey to audiences that whilst Israel agreed to extend the truce, terrorists in Gaza both broke it four hours before it expired and refused its renewal. Likewise, the fact that, from 08:01 on August 8th intense missile fire on Israeli civilians carried on for some two and a half hours before Israel responded is not made sufficiently clear. A prominent theme appearing in BBC reporting even before the 72-hour ceasefire, but more frequently since negotiations in Cairo commenced, is context-free promotion of Hamas’ demand to lift border restrictions. To date, not one BBC report has attempted to properly explain to audiences why those restrictions were implemented in the first place or the potential effects of the lifting of a blockade aimed at preventing the flow of weapons into the Gaza Strip. Kevin Connolly’s filmed report of August 9th for BBC television news ticks both those boxes. 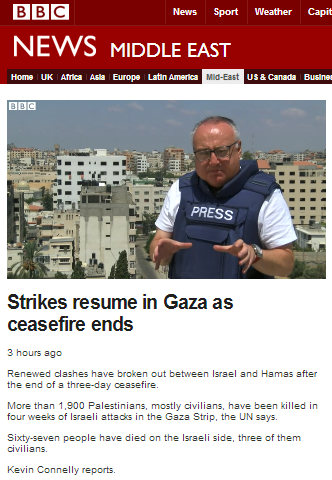 The report also appeared on the BBC News website under the misleading title “Strikes resume in Gaza as ceasefire ends” – with no mention of the missile attacks which preceded those “strikes” whatsoever – and with an ambiguously phrased synopsis. Connolly’s account begins with reversal of cause and effect. Connolly refrains from providing viewers with the necessary context: the use of mosques by terrorist organisations for weapons storage, tunnel construction and so forth. He then moves on to some equally context-free promotion of the Hamas demand to lift border restrictions. Significantly, Connolly obviously finds it unnecessary to point out to viewers that the border restrictions were put in place because the Israeli government believes that its citizens also have rights, including that to live a normal life free from terror attacks. Additionally, Connolly offers no context on the topic of building materials – remarkable considering that the evidence of misappropriation of such materials by Hamas for the purpose of terror is readily available – and fails to inform viewers of the real reasons for the shortage of medical supplies in the Gaza Strip. As we see, despite the BBC’s ostensible ‘road to Damascus’ moment the day before this report was produced, the reporting of context-free casualty figures continues. It is, of course, the BBC’s obligation under the terms of its constitutional document to inform audiences in a manner which will “build a global understanding of international issues”. The abuse of that mission as manifested by the barrage of context-free politically motivated promotion and amplifiction of Hamas demands relating to border restrictions becomes more apparent by the day.